Did a mistake save the world? A Cuban anti-aircraft battery in October, 1962, during the Cuban missile crisis. For 13 days in October 1962, President John F. Kennedy faced the task of avoiding Armageddon. 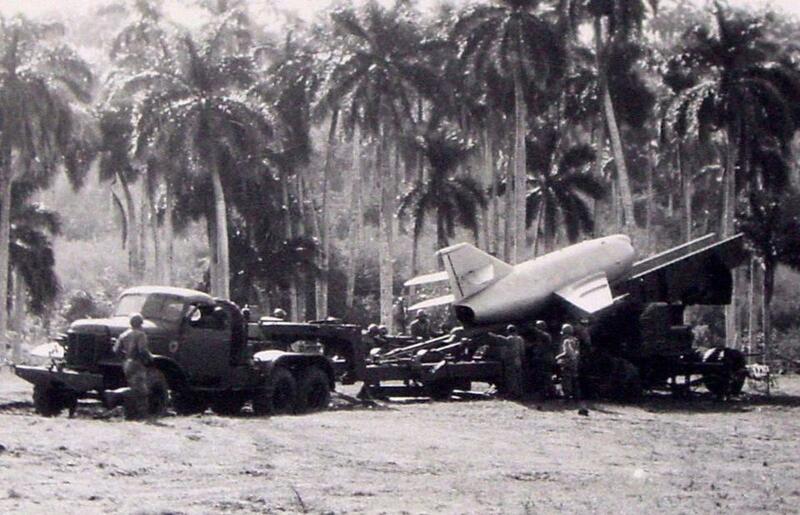 American reconnaissance planes had just detected Soviet missiles in San Cristóbal, a city in western Cuba, and the United States was determined to expel them. The Soviets and Cubans were equally determined to keep those weapons in place. In deciding what to do, Kennedy found himself facing off against his own Joint Chiefs of Staff, who unanimously recommended a full-scale attack and invasion of Cuba, as did other top advisers. Kennedy feared that such an attack would lead to the Soviet Union using nuclear weapons against the United States, to which America would have to respond in kind. Millions, perhaps billions, would be killed. Desperate for an escape hatch, the president found one in history—more specifically, in a book published earlier that year, Barbara Tuchman’s “The Guns of August.” In her sweeping account of World War I, which would later win the Pulitzer Prize, Tuchman argued that European leaders slipped into the Great War essentially by mistake. Every country on the continent miscalculated, underestimating the economic and military costs of a potential war, the likelihood of one breaking out, the possibility of a single event spiraling out of control, and their opponents’ willingness to fight. No country wanted a continental war, but they all got one. It became the most costly and horrifying conflict the world had yet seen, and it was essentially an accident. To Kennedy, the lesson was clear: Great powers could accidentally slide into war if their leaders were inattentive to the dangers ahead of them, and it was his job to prevent that from happening. “I am not going to follow a course which will allow anyone to write a comparable book about this time [called] ‘The Missiles of October’,” Kennedy told his brother Bobby during the crisis. He wanted to “send a copy of that book to every Navy officer,” he said. JFK made his aides read “The Guns of August” and had copies distributed to every US military base in the world. Quite possibly, Kennedy’s careful reading of the book helped prevent a nuclear war. But historians now know something else as well: Barbara Tuchman’s thesis about WWI was wrong. In fact, the war wasn’t the accident she portrayed: Subsequent research in the archives of Imperial Germany has conclusively shown that Germany did want a war, one that would allow it to dominate the continent. Today, “Hardly any scholars accept the Tuchman thesis that WWI was an accidental or inadvertent war,” says John Mearsheimer, a University of Chicago professor. Kennedy, in other words, pulled the world back from the brink on the basis of a book that misread history. The story of the missile crisis has long been seen as an example of the wise use of history in making decisions. But it also raises a question: If a leader can come to the right decision for the wrong reason, what purpose is history actually serving? 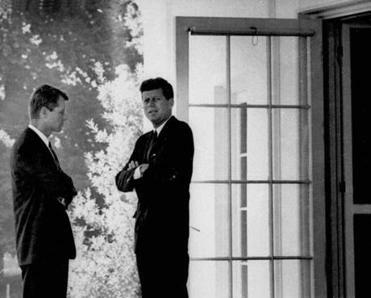 President John F. Kennedy (right) confered with his brother, Attorney General Robert F. Kennedy, at the White House on Oct.1, 1962. As long as lawmaking has existed, practitioners have looked to the past for guidance. The ancient Roman statesman Cicero said, “To be ignorant of what occurred before you were born is to remain always a child.” Today’s leaders have another 2,200 years of recorded history to look back on—a nearly bottomless trove of human experience from which to study. Some history programs have been developed specifically to close the gap between history and lawmaking: The universities of Cambridge and London, for example, recently launched a high-profile program in which academics tutor British politicians on historical events in order to help them formulate policies. American presidents are routinely photographed with history books tucked under their arms. Recent history is littered with examples of leaders falling back on history with, at best, mixed results. In making its case for Iraq’s invasion, George W. Bush’s administration often made references to the failure of democracies to confront Hitler earlier than 1939. Secretary of Defense Donald Rumsfeld in August 2002 said that Hitler’s intentions were always clear but ignored for years. “Well, there were millions of people dead because of the miscalculations,” he said. Critics of the Iraq invasion might suggest that hundreds of thousands are now dead because that parallel itself was a miscalculation. The same analogy was used by Lyndon Johnson: “Surrender in Vietnam [wouldn’t] bring peace,” he said at a 1965 White House press conference, “because we learned from Hitler at Munich that success only feeds the appetite of aggression.” He chose to escalate the war, which continued for 10 more years. History also applies in the domestic sphere. Early in his term, President Obama was spotted carrying a book on Franklin Roosevelt’s presidency, which is widely seen as shaping his approach to pursuing health care reform. “When FDR proposed Social Security, all across what was I guess the equivalent of today’s Internet, right, all the newspapers and the radio shows and all that—he was accused of being a Socialist,” Obama said at a public forum in September 2009. Obama relied on FDR’s example as he withstood the immense criticism that came with his efforts to pass the Affordable Care Act. The late historian Arthur Schlesinger Jr. called this susceptibility “history by rationalization.” What politicians are falling prey to is what psychologists call “confirmation bias,” whereby people tend to both seek out and trust only information that corroborates their judgments. And policy makers have lots to choose from. Billions of words have been written about historical events, offering modern-day thinkers plenty of material to convince themselves of the wisdom of their thinking. 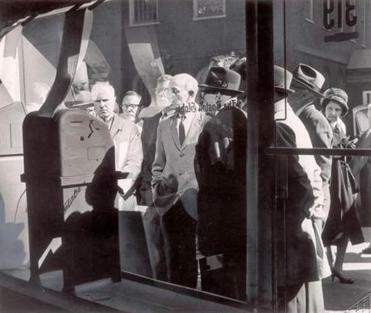 Anxious watchers checked the Associated Press teletype machine at the Boston Globe's downtown office as President John F. Kennedy declared a blockade of military equipment bound for Cuba. in October, 1962. JFK was an avid, close reader of history. His Harvard thesis, later published as a best-selling book, was about England’s policy towards Nazi Germany in the 1930s. “I think I was always interested in history, and have spent a lot of time on it,” he once said. To Kennedy, the events of October 1962 were powerfully reminiscent of the lead-up to war 50 years earlier that Tuchman described. Once again, the world’s leading powers were on the brink of a war that none wanted, a conflict that might be averted if the leaders had enough will and diplomatic creativity. The president personally overruled the consensus of nearly all his advisers and offered the Soviets a secret compromise through intermediaries, among them Bobby Kennedy. They would remove their missiles from Cuba, Bobby secretly told the Russian ambassador, and in exchange America would remove its missiles from Turkey and Italy. The offer was accepted, averting catastrophe. Had the crisis spawned a war, Allison estimates that approximately 100 million Americans and more than 100 million Russians might have been killed. Did Kennedy’s reading of history reshape his plans, or just confirm them? David Welch, coauthor of “The Cuban Missile Crisis: A Concise History,” suggested the latter: that Kennedy was “already primed” to seek a peaceful way out of the crisis, and Tuchman’s book furthered his belief that a hasty turn to military action would be both disastrous and avoidable. “He was inclined to look for a way out without going to war, and Tuchman elevated his fear and made clearer in his own mind the consequences of unwarranted war,” Welch said. Tuchman’s influence on Kennedy suggests something we might not always want to admit when considering the importance of history to leaders: that its value depends more on who applies it than on how well they, or even the historians whose work they’re reading, grasp the past. Had Tuchman seen the German archives and gotten things right, Kennedy might have disregarded the book—or perhaps found endorsement of his views elsewhere. And had a different, more bellicose president read Tuchman’s book, he might well have taken it to show that Khrushchev’s gamble to place missiles in Cuba made war inevitable. As it happened, in Kennedy’s hands “The Guns of August” became one of the most helpful incorrect books of all time. In the end, just as JFK hoped, a book called “The Missiles of October” never needed to be written.